The Leafs' offense is great. The defense? Not so much. In the first week of the NHL season, fire-powered offenses have been on full display. We’ve seen crooked box scores across the league ranging from 7-0, 7-6, 7-4, 8-6 and 7-6. For those who love goals, this season has been absolutely fire. For those who love defense, not so much. One team who perfectly embodies the all-offense, no-defense mentality is the Toronto Maple Leafs. Going into the new season, it was pretty clear Toronto had one of the most talented offenses in the league. 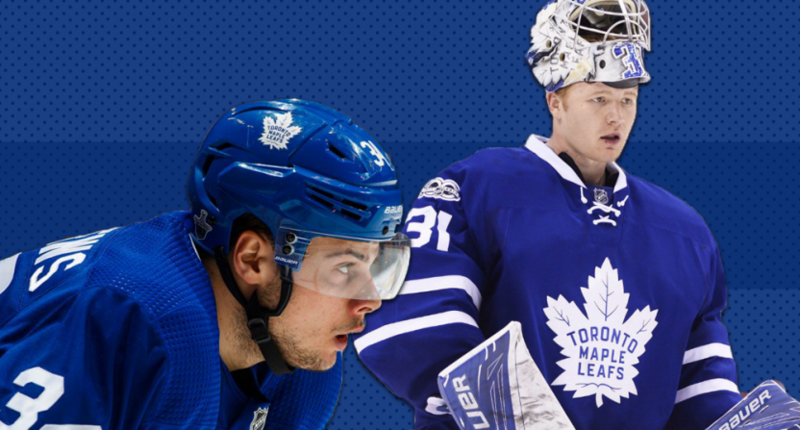 With a murderers’ row of young, dynamic offensive players like Auston Matthews, Mitch Marner and William Nylander mixed with big free agent signings John Tavares and Patrick Marleau, the Maple Leafs’ offense is, frankly, incredible. So, it comes as little surprise that Toronto is tied atop the Eastern Conference with 13 goals in just three games. That’s without 20-goal scorer Nylander, who’s sitting out due to contract negotiations. Matthews has five goals and Tavares has four. Toronto could (and maybe should) score the most goals in the league and look damn great doing so. But, problems still remain for the Maple Leafs to take the next step into contention, starting with the team’s dreadful defense. It’s hard to judge a team after just three games, but it’s becoming apparent that Toronto’s defense might hold the team back. They’ve allowed 13 goals (the second most in the East) and while that’s not all on the backend, Leafs defenders seem overmatched at times. The defense was always going to be a weakness for Toronto as the team is unquestionably top-heavy, but defenders such as Nikita Zaitsev and Ron Hainsey are hard to watch against opposing team’s top lines. Free agent signee Igor Ozhiganov has looked entirely overmatched. Morgan Reilly is probably the most consistent defender on the team. Jake Gardiner does a lot right, even if he is prone to boneheaded, costly mistakes. Travis Dermott has also been solid. But, the Leafs need to reconfigure their d-core or add to it. At this rate, the Leafs’ defense may hold back a Stanley Cup team. It’s a talent issue. Again, it’s early, but we know what to expect from these players at this point. On the flip side, It’s hard to blame Leafs goaltenders for allowing so many goals. But, the Leafs might have trouble behind starter Frederik Andersen. GM Kyle Dubas opted to waive the surprisingly steady Curtis McElhinney and allow Garret Sparks to take over behind the starter. The move made sense, as the Leafs wanted to see what they had in Sparks, a drafted and developed goalie with an abundance of success in the minors. Sparks’ first start in Chicago was brutal. He allowed six goals despite picking up the win. It’s one game, I know. However, Sparks had a brutal training camp, hasn’t had any NHL success prior and looked incredibly shaky giving up goals at inopportune times. Bad defense and bad goaltending is a frightening combo. Andersen might need to start 70 games. With all that said, the Leafs shouldn’t be in panic mode. The offense is that good. There’a good chance they’re going to win a lot of 7-6 games. The defense is bad and the goaltending behind Andersen isn’t looking promising. But, Matthews, Tavares, Nylander and Mitch Marner outweigh any of those potential worries. Adding to the D and bringing in a vet backup would simmer down concerns. It might not always be easy to watch the Maple Leafs, but it will surely be an entertaining up-and-down thrill ride. The first three games of the season proved that.